Purpose: Use this document as a reference to understand how to view a customer (student) account. Student Financials contains detailed financial information for every student – registration charges, payments, course fees and penalty fines, financial aid, etc. Current and historical data is retained in various modules of the system. 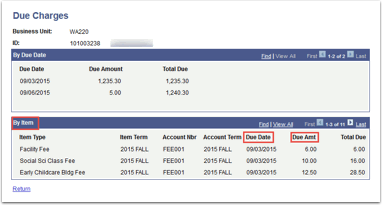 There are several different pages that may be used to view a student’s financial information. The Customer Accounts page gives an overview of the student’s activity for the term. You can drill down to review information on the student’s account using various links. 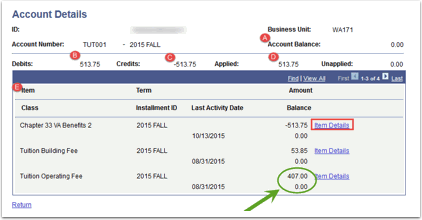 The total on the student’s account can include a dollar amount from a previous term. The Anticipated Aid amount is the total the student might receive for the current academic year. It is not the total for the term you are currently viewing. 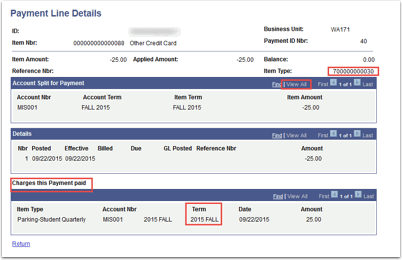 The account balances are summarized by Account Type. Click on the Account Details link next to the account type for more information. Displays the total balance for the account number. 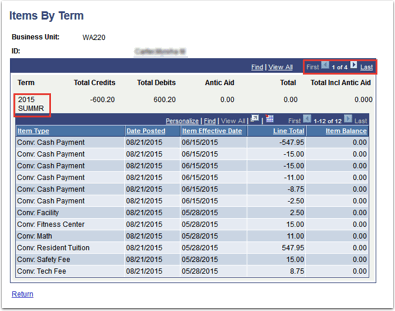 Displays total amount of debits to the account. Displays total amount of credits to the account. Displays the total amount of payments applied. Displays each line item associated with the account number. You can click Item Details for more information. It also shows you the last activity date on the item type and if there is a balance outstanding. Each item has 2 lines. The top number is the amount charged and bottom number is the balance. The Bottom number will vary in amount based on if there have been payments made. If the balance is 0.00, then the item has been paid. If the amount charged is 0.00 and the balance is 0.00, then the item may have been reversed; meaning the item is still there but the student does not owe anything. Shows you more information about a specific item type. Can see the ItemType Number along with the details about payments posted to the balance. You may need to click the View All link to see the activity for the item type. 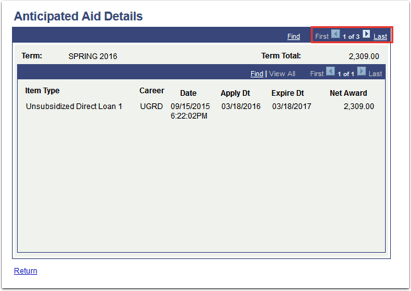 You can also see any payments, including financial aid that has been applied under the Payments paying this Charge section. Same with the charge item types. You can see what charges a payment paid under the Charges this Payment paid section. It also tells you which term is associated with the payment/charge. 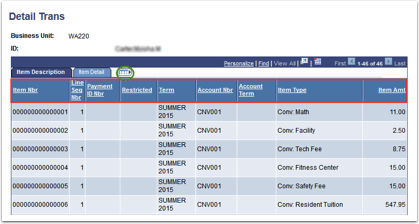 Details Trans link provides item type descriptions on the student’s account. It will also show you all the charges and payments by item number. You can click on any of the headers to reorder the rows. There is also an expand button (circled in green) to view both tabs at once. Another way to view item type information on the student’s account. This is useful for seeing all the item types at once. 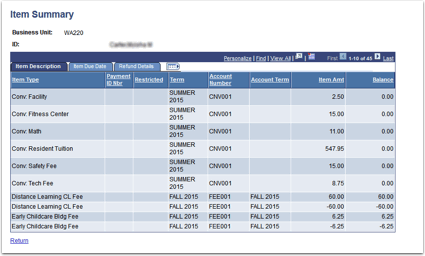 Shows detail information about the item types on the student’s account based on term. Use the arrows to navigate to other item types. You can sort the item types based on posted date, effective date, bill date, and due date. Shows the item types with an outstanding balance along with when the charges are due. 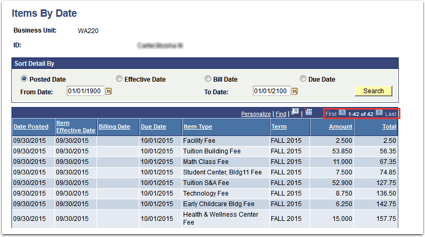 Shows detail information about any payment plans associated with the student. This includes any third party contracts associated with the student. 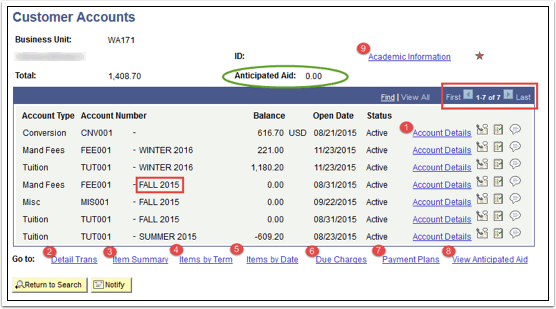 Shows information about financial aid the student has been offered. The total amount on this page is for term. Shows the enrollment activity by term for the student. You can also view the academic plan the student is associated with. Concurrent students will have more than one of the same terms. You may need to click the View All button to see if there is more than one of the same term. 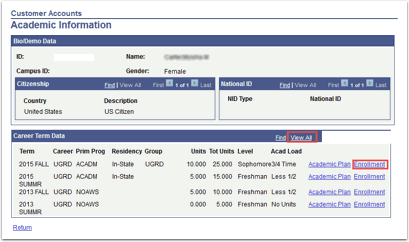 The Enrollment link drills down to view student’s specific class information.